Reverse osmosis is a method for treating water and wastewater in order to reduce dissolved solids or “salts” in the effluent discharge. This technology is used globally in drinking water and industrial applications. The process involves applying pressure to the influent water stream to overcome osmotic pressure and reverse the natural osmosis process, filtering out salt ions down to 0.0001 microns. This process removes 95-99% of TDS (total dissolved solids), organic matter, bacteria and 99%+ of all suspended solids. Each system is custom designed for the application. Our designs can be mobilized in containers up to 300gpm or skidded systems up to 2,000gpm. When combined with electrocoagulation as a pretreatment, reverse osmosis can be used in applications where it has not been applied successfully in the past. WaterTectonics has applied reverse osmosis technology successfully in treating mining wastewater and produced water waste streams in the oil and gas industry. Reduces dissolved solids or salts in effluent discharge down to 0.0001 microns. The process removes 95-99% of TDS (total dissolved solids), organic matter, bacteria and 99% of all suspended solids. Containerized systems up to 300gpm or skidded systems up to 2,000gpm can be mobilized. Reverse osmosis is a mechanical process in which pressure is applied to a concentrate solution to overcome the osmotic pressure and reverse the direction of the solute flow. 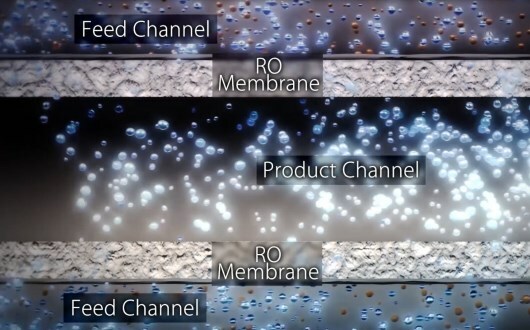 Membranes are designed with cross-flow filtration technology. 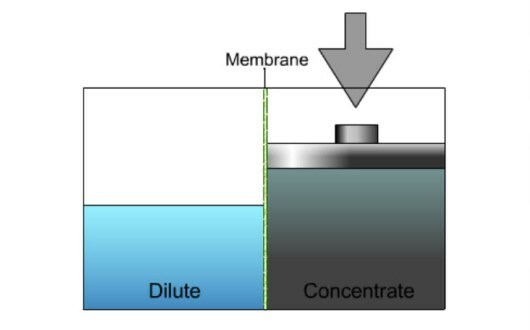 Pressurized solute flows across the surface of a membrane through the feed channel spacer. Approximately 10-15% of the feed water will diffuse through the membrane and flow through the permeate spacer around to the permeate tube. 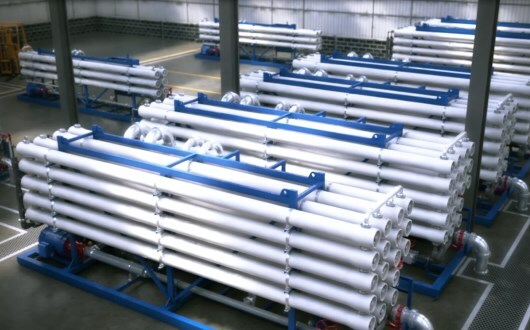 Rejected brine that does not enter the product channel is combined with reject brine from other membranes and can either be treated by a reject-recovery reverse osmosis system or disposed of via deep-well injection.